PHILADELPHIA (WPVI) -- With frigid temperatures gripping the Delaware and Lehigh valleys, the Philadelphia Water Department has some ways to prevent frozen pipes and avoid costly repairs. PWD officials say to let the faucet run at a trickle overnight during extremely cold weather. It costs only pennies, and the moving water will help prevent the pipes from freezing. Wrap and insulate all water pipes in unheated areas, such as your basement. Officials say to pay close attention to pipes near exterior walls, especially in kitchens and bathrooms. They say to repair or replace broken exterior windows. Cover windows with plastic and caulk windows near water meters and pipes. The PWD points out that when cold air blows on a pipe, it increases the risk of freezing. The water department says to identify the location of the shutoff valves for your water supply; it's usually near the water meter. In emergencies, use the house-side service valve to shut off your water supply, they say. They say to disconnect garden hoses and shut off the outdoor water supply. Most outdoor faucets have a dedicated shutoff valve inside; use that valve, and leave the outside faucet open to drain the remaining section of pipe. First, the water department says to check if your neighbors have water. If they have a loss of water too, it may be the result of a main break. But if they have running water, it's likely your pipes have frozen. - Do not apply direct heat to the pipes. If your pipes freeze, use a space heater or hair dryer to heat the area around your meter and pipes. - Make sure the faucet is turned on so melting water can drip out. 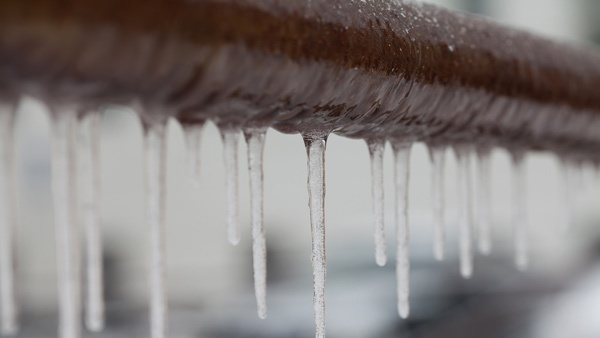 - After your pipes have thawed, look to see if your pipes are cracked or damaged and make sure to take necessary precautions to prevent freezing from happening again. - Inspect your water meter for damage throughout the winter. If you notice leaking, let PWD know by calling (215) 685-6300. - If the break is in a hot water pipe, close the valve on top of the water heater. - Call a licensed and registered plumber to repair the broken pipe. The Philadelphia Water Department says the pipes inside and outside city homes, up to the water main, are your responsibility. They say you may need to call a licensed and registered plumber. "The Philadelphia Water Department is not responsible for your pipes, even if they are outside of your home," they say. "The Philadelphia Water Department knows broken pipes can be a nightmare. However, we cannot fix pipes on your property."